Screaming fly reels are the norm on the trophy-managed trout waters booked for fly-fishing through Reel Angling Adventures. Rainbows average 3 pounds, 8-pound beauties are common, and 10-pound-plus trophies have been landed. Our anglers also land the occasional trophy brown trout -- golden beauties that have eclipsed the 5-pound mark! Our guides say they see even larger trout from time to time, but we haven't been able to get a picture of one yet. Maybe you'll be that lucky angler! A Stunning, Fly-Fishing Only Trophy-Trout Fishery Alongside North Georgia's Newest Shooting Preserve. Where its headwaters tumble sharply off the north slope of Georgia's scenic Blue Ridge Mountains, Noontootla Creek stands among Georgia's trout-fishing gems, proving stunning wild rainbows and browns can make a name for a small public trout stream of the Chattahoochee National Forest. Just beyond the national-forest boundary, Noontootla Creek flattens its steep gradient to flow across the pastoral bottomland of Noontootla Creek Farm. Here, the fishery -- that just upstream measures success with 16-inch beauties on public land -- supports trophy-trout fishing on more than 1,500 acres of the beautiful Noontootla Valley where 16-inch trout mark the short side of catches that often stretch 24 inches and more! At Noontootla Creek Farm, we book half- and full-day fly- fishing trips for rainbow and brown trout that measure up to any angler's criteria for trophy minimums. Four fishing beats of one-half mile each stretch across 2 miles of wooded stream bottom offer challenging environments for fly-rodders of all skill levels. Beginners enjoy the straits associated with deep pools and sweeping curves. Experienced fly-fishermen tangle with the technical environments of swift shoals, pocket water and low canopies. 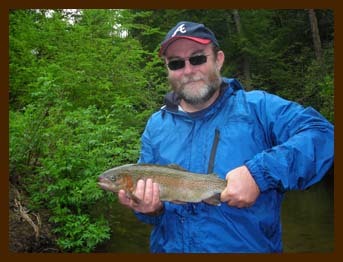 Exclusive Private Mountain Setting for Fly-Fishing for Trophy Trout on the Upper Toccoa River! Tooni Cove Farm is a 42-acre outdoors stage located 19 miles east off Blue Ridge. It features more than half a mile of private access to the Toccoa River, one of North Georgia's longest rivers, under strict regulations of catch-and-release fly-fishing only. All bookings close the waters of the Toccoa River on Tooni Cove Farm to other parties. Share its cold, clear water with up to four of your fishing buddies on half-day trips only. Or consider booking the scenic mountain cove for an event-styled outing, where you can compete for long-rod bragging rights with up to 12 of your co-workers, friends or family members. The trout of Tooni Cove Farm are well-managed, moderately pressured and carefully handled. 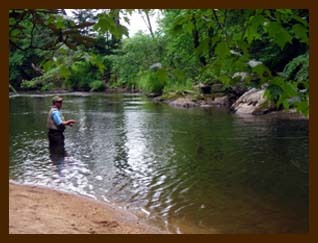 The fishery staff -- from the trio of landowners to the guide team of Reel Angling Adventures -- is in its sixth year of operating the venue, having learned the management techniques important to both the fish and the water -- taking care to maintain a natural environment in which the trout do not become the “pets” some anglers associate with a private fishery. B-I-G Rainbows and Browns on the prettiest trout water in Georgia on the upper Toccoa River at Tooni Cove Farm, and Noontootla Creek at Noontootla Creek Farm.